NEVER LEAVE YOUR INSTRUMENT IN A CAR (even in the trunk) OR EXPOSE IT TO DIRECT SUNLIGHT! 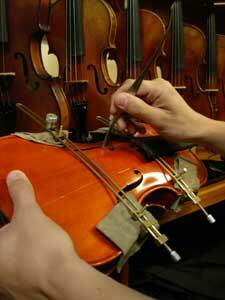 - the glue will soften and your instrument will fall apart. - your rosin will melt and bond to the varnish. - your bow hair and instrument will dry out. - your bow will severely warp. - the wood will dry out and crack. - your bow hair will become brittle and break. - Make sure your hands are clean before touching your instrument. - Loosen your bow hair before putting away your instrument. - Store your cello either on its side or in a corner of the room with the bridge facing the corner. - Store your upright bass in a corner with the bridge facing the corner. THE MOST IMPORTANT PART OF THE CARE AND MAINTENANCE OF YOUR INSTRUMENT IS LOVE!